He’s been teasing his global Glamberts with behind the scenes vision for the last few weeks, so it’s stands to reason that US singer Adam Lambert couldn’t keep his devoted fans waiting for too much longer. Yes, he’s officially premiered the video for ‘Never Close Our Eyes’ – the second single to be lifted from his top ten album ‘Trespassing’. And it looks as though something’s seriously wrong. He’s imprisoned in some kind of camp, devoid of his freedom and any colour (except, of course, for some blonde specks in his hair). But you can see it in his eyes, kids. He’s longing for more. He’s starting to question what it’s all about, why here’s there and indeed what lies beyond those grey walls. He and he co-horts make a run for it, they’re stopped at the gates by guards brandishing canisters of gas (could be smoke machines). What happens next? You’ll just have to watch and see. Now if only Aussie radio would bite the bullet and play his tunes, there might be many more happy Adam campers living in this world. Sadly, it seems, the masses are being controlled by the radio powers that be (spookily a little like what’s happening in the clip…). Great clip, as are all Adam’s clips, and I love the song. Adam’s 2nd album Trespassing debuted on the American Billboard 200 chart at #1 and yet radio in Australia won’t play his singles from it. Something is seriously wrong! I watched the recent Sunrise clip interview with Adam (currently in the UK) in which he said he hopes to visit Australia in the next few months so if that eventuates, perhaps Oz radio will finally get on board and the Adam love will be rekindled Down Under. Never Close Our Eyes is a great song and this is a great clip. Adam Lambert’s previous single, Better Than I Know Myself is a fab song too and the video is superb. Why the heck doesn’t Australian radio play Adam Lambert’s songs? They played the 3 singles – Whataya Want From Me, If I Had You and For Your Entertainment – from his For Your Entertainment album – and all singles did really well. Australia is not going to attract the top echelon of singers to this country if radio stations snub their music. I dont understand why no one is buying his music. I love Adam. I bought his debut album 3 times. 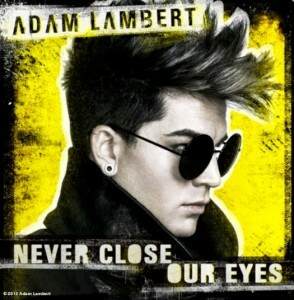 Never Close Our Eyes is one of my favourites by him, first time I heard it, I loved it. Yet, its nowhere to be seen on Itunes or ARIA. I dont get it. This is brilliant. And YES re your last statement!!!! Very sad to see our Aussie radio/music industry being so controlled and restricted. Even his own record label doesn’t promote him in Australia – preferring to run with the crowd and pimp One Direction/Beiber/Guetta etc or local tv talent show judge’s/winners shopping centre gigs! Nothing against any of those artists but you’d think when a bloke on YOUR label has America’s #1 album you’d kinda give him a bit of a shout out or something. WHOA!! Adam has come out “blazing guns” again … with this video clip. I read in a couple of other articles that Adam and his cohorts are supposed to be in a hospital but don’t know if that’s correct. Whatever, it’s a mighty fine clip and I adore the song. I just wish Oz radio would play Adam’s songs because they really are very good.